recruitment 2018. 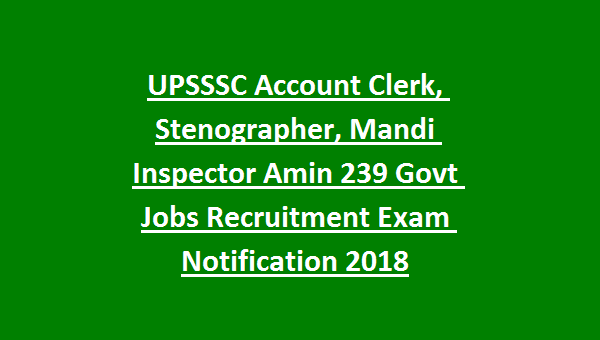 Available posts are Stenographer, Mandi Inspector Amin and Account Clerk in this UPSSSC Recruitment 2018. An objective type OMR /CBT online based test and interview will be conducted for the candidates selection for Account Clerk and other posts. Interested candidates can apply online for this UPSSSC Mandi Inspector Amin, Stenographer Jobs through upsssc.gov.in website on or before 26-12-2018. 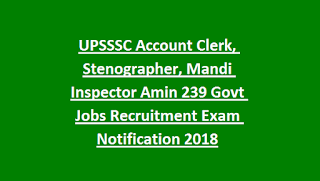 For more information regarding this UPSSSC Recruitment Notification 2018 of Mandi Inspector Amin, Stenographer and Account Clerk jobs selection process, ost wise vacancies, age limits, salary, application process and other details are given below. There are total 239 posts in this UPSSSC recruitment 2018. Age limits are 21-40 years for General candidates,3 Years age relaxations for OBC Candidates and 5 years for SC/ST candidates. An objective type written exam and interview will be conducted for the candidates selection. Apply online for this Uttar Pradesh Rajya Krishi Utpadan Mandi Parishad Jobs Recruitment of Mandi Inspector Amin, Account Clerk and Stenographer Posts. UPSSSC Online applications submission last date is 26-12-2018 through official website of UPSSSC @ www.upnrhm.gov.in.